Comfort House is seen Friday in McAllen. McALLEN — Days before David Perez was hired to lead Comfort House, one of his predecessors was convicted of capital murder. Three months before being hired, his immediate predecessor resigned after public pressure mounted. But Perez doesn’t want to talk about that, he says. And he doesn’t want to talk about himself. He is the director of Comfort House — the short-term, temporary care center for terminally ill people. There are 10 beds and 12 staff members at the Central McAllen facility. There’s a garden out back and a chapel inside. Anonymous donations appear on the porch, and for that, Perez is grateful. But Perez cannot ignore the past. Ten months into his tenure, he has mostly done what his two predecessors did not — keep Comfort House out of the news. In order to do that, and clear the “dark cloud” from hovering over Comfort House, Perez does what he says he doesn’t want to: discuss the past and talk about himself. Perez is 43 years old and grew up in Rio Grande City, where he had worked in health care. He earned a graduate degree in counseling and beat out nearly 50 applicants for this job, he says. Since his hiring in November, Perez has held events on site, a sold-out luncheon in May, a recent open house, with a barbecue benefit planned for Saturday. He has more fundraisers in the works. But the biggest challenge has been discussing things he would rather not. He can’t answer for his predecessors, one of whom was City Commissioner Veronica Whitacre. Perez praised Whitacre’s work over her near two-year tenure as Comfort House director. Perez tries to explain the nonprofit’s mission, which is to provide a place for people to die with dignity. Sister Marian Strohmeyer set this mission when she opened Comfort House in 1989, originally for HIV and AIDs patients. Whitacre says she did the same when trying to fundraise. She was able to renovate the building thanks to grant funding. But her position as a city commissioner complicated things. 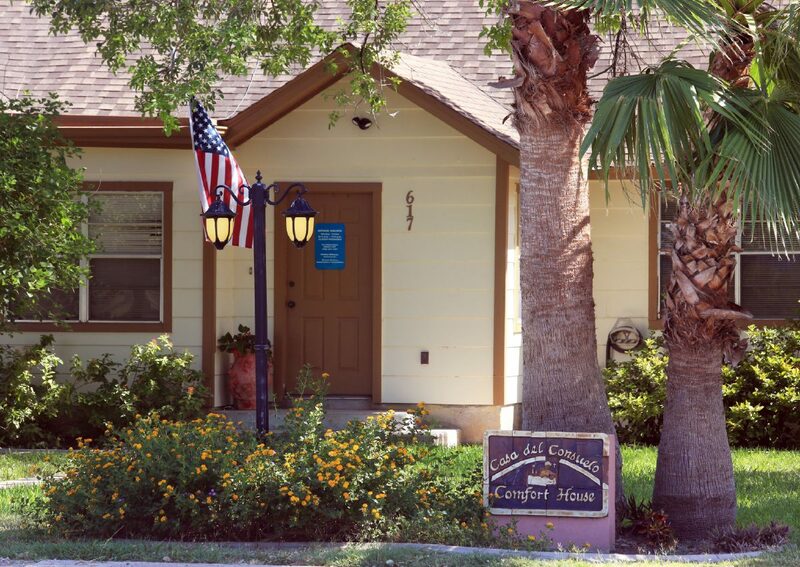 Comfort House had historically received funding from the U.S. Department of Housing and Urban Development. But the federal agency saw Whitacre’s dueling roles as a conflict of interest, so HUD declined to give Comfort House $50,000 a year ago. City commissioners, with Whitacre not participating in the vote, also opted not to give any funding. Commissioner John Ingram has been critical of the Comfort House board for hiring a city commissioner, saying it sets a bad precedent for potential future commissioners seeking employment at organizations that receive funding from the city. Despite these hurdles during Whitacre’s time as director, she also had to deal with fallout from her predecessor, Monica Melissa Patterson. Months before Whitacre’s hiring, Patterson, while director, was arrested on a capital murder charge. She was later found guilty of ordering the death of the husband of a woman staying at Comfort House. Many in McAllen have known Whitacre and her family, and that name identification helped Whitacre recover the reputation of Comfort House, she says now. However, after building pressure, Whitacre resigned in August 2017. Three months later, at the beginning of November 2017, a jury found Patterson guilty of capital murder. Days later, Perez was hired to run Comfort House. He has fundraisers scheduled over the next several months, and will continue his open door policy for people — especially decision makers, he notes — to visit the facility. Maybe they’ll have questions about the past. And maybe, they’ll have questions about him. He’ll have to answer them all.